The Japanese artist Ichiro Kikuta held in 2015 with an exhibition and gave a workshop as a guest of Art on the Campus of the University of Antwerp in the exhibition space of the former convent of the Grauwzusters. First a few biographical details that make the work of the artist better known. He was born in Fukushima in 1961. During his youth he often spent time in the open nature, in the rice fields. He even became a proficient bird watcher and nature guide. But from an early age he was also fascinated by traditional Japanese art forms. In this way he came into contact with Shiko Munakata, a well-known artist whose specialty is the woodcut and as a favourite theme nature, in all its forms, but especially birds and insects. Ichiro Kikuta also looked across the border. In this way he came into contact with Western artists, such as the Brit Charles Tunnicliffe, a purebred painter of nature. Already in 1986 Ichiro Kikuta was honoured at an international competition in the USA with a work on birds. The artwork was promptly purchased by the Wisconsin Museum. In 2000 he again won a prize in the museum of Nara. He lived and worked in various places in Japan, including in northern Hokkaido, until he moved to the subtropical Okinawa in 2006. He live in a traditional house in a small village in the deserted northern part of the island, beautifully surrounded by nature. Yambaru is the name of the region where he lives and works and which is very important to him. He draws his inspiration from it, but it is also his personal source of energy. 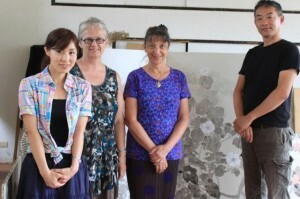 He began to specialise here more and more in Japanese painting. 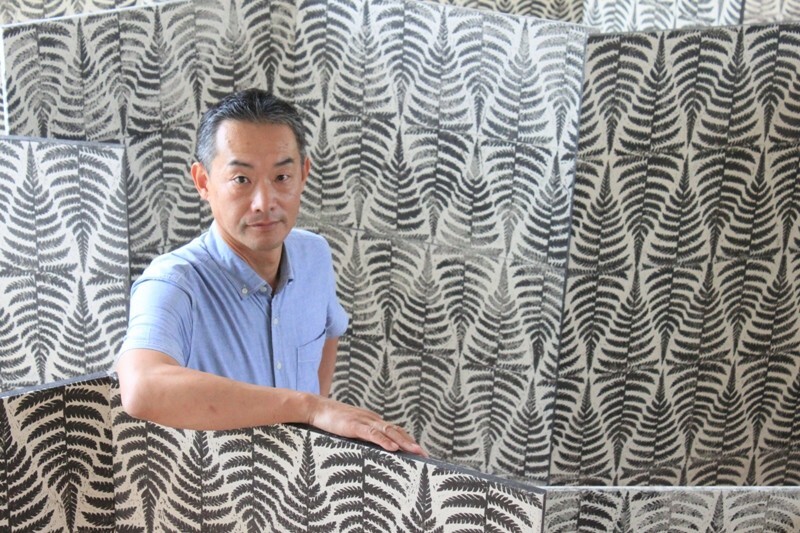 Ichiro Kikuta continues with a lot of verve a Japanese tradition of painting screens. He uses the age-old techniques. He still uses paper hinges, but he has opted for a framework of Japanese cedar wood, instead of bamboo. He uses the traditional Japanese Washi paper. This type of paper has been recognised by UNESCO as an intangible heritage of humanity. It is hand-crafted through a long and complicated process. The artist uses the paper made from the bark of the equally traditional mulberry tree. Ichiro Kikuta therefore mans one of the rare artistic studios that run the entire process manually according to the rules of art and with only natural materials. But there’s more. He is also a talented painter. He works mainly with wahed and especially black ink. If he does apply a color test, it is with dyes he makes himself. This creates beige from crushed shells, red from crushed coral, yellow from sulfur sulphide, and he even incorporates gold and silver. This attention to nature, tradition and craft, but also that artistic drive ensure that Ichiro Kikuta’s work not only fits in the line of history, but also has a place in contemporary art. 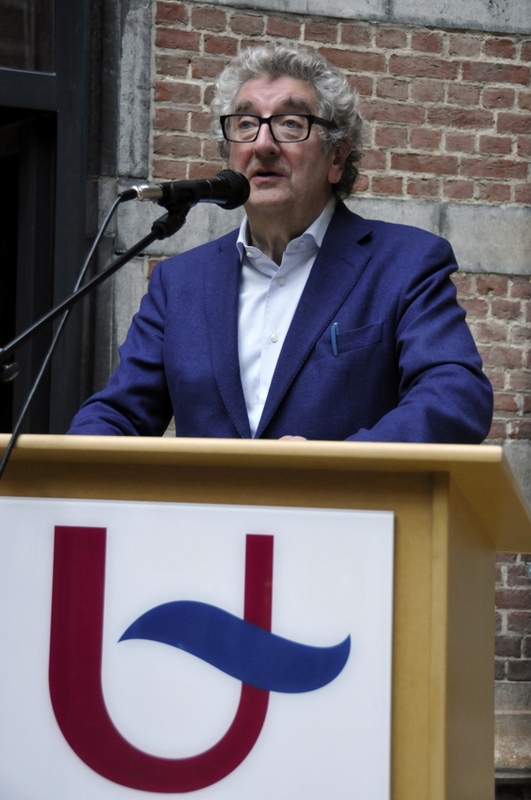 Ernest Van Buynder, honorary chairman of the Antwerp Museum of Contemporary Art and former chairman of Art at the Campus University of Antwerp. February 2018. Antique paintings are often mostly appreciated in a museum or an exhibition. We admire the techniques, composition, colours displayed. The moral or political message the artist tried to convey however has often lost its appeal or we do not even notice it any more. Ichiro Kikuta is using old techniques while bringing a message that has a meaning for the contemporary society. In our hectic times of city life the images of nature have a calming, soothing effect. The artworks of Ichiro Kikuta exude this calm and peace, and yet are full of life. The imperfections of leaves for example reflect the struggle and reality of nature, the force and the cost of surviving. The birds sitting on the empty beach, bracing for the taifun make us almost feel the wind. Anticipating and appreciating the strength of nature. Another aspect of his work that appeals is the very Japanese art of omitting. To a western person blanks in a painting can be confusing : did the artist lack inspiration ? was he lazy ? Slowly one realises it was a difficult task to choose and omit all unnecessary details. The result is offering the viewer space to use his/her imagination, to complete the image, to enter into the world created by the artist. 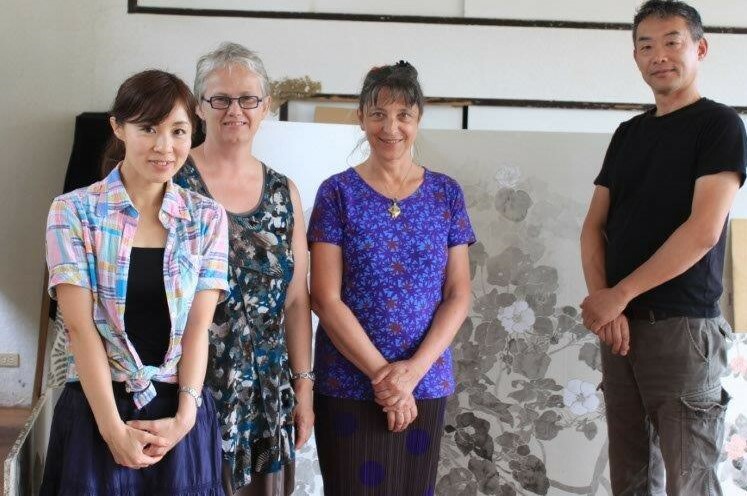 By choosing the old byobu techniques to represent Yambaru nature of the island of Okinawa Ichiro Kikuta has become a very interesting nowadays Japanese artist. With his skills and talent he produces works that look quite innocent and simple at first glimpse, but pull the viewer into a world of modest magic for those who can see it. His works are a tribute to the eternal force and the riches of nature.